SunFest 2017 • Musical Fun in the Sun on the Waterway! The musical festivities begin Wednesday evening, May 3,2017 at 5:45 pm, and continues each night through Sunday, May 7, 2017, ending with the BB&T Fireworks Show at 9:00 pm. Three stages, sponsored by Ford, Tire Kingdom, and Jet Blue, will be used for the performances. 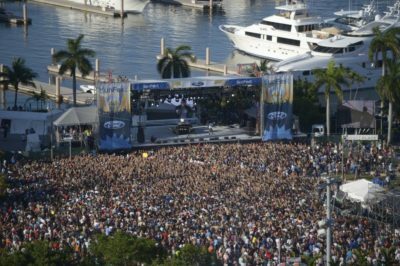 SunFest takes place along the Intracoastal Waterway in downtown West Palm Beach generally at 100 Clematis Street in West Palm Beach, FL. The festival grounds are on Flagler Drive. From North Banyan Boulevard down to Lakeview Drive are the north and south boundaries, respectively. Friday, May 5th 5 p.m. – 10 p.m.
Saturday, May 6th Noon – 10 p.m.
Sunday, May 7th Noon – 9 p.m.
Tickets are available online at: SunFest 2017 Tickets. There is a schedule that can be downloaded that shows the date/time of each musical group’s performance. Interested in buying or selling a home in West Palm Beach? Give us a call or text 1-561-624-4544. Click on the Real Estate below You would like to see. You’ll be taken to a page of MLS listings just as you requested. When you see something you like, Call or text 1-561-624-4544. Smart Home Tech – Here to Stay?